American manufacturing is on life support—at least, that's what most people think. The exodus of jobs to China and other foreign markets is irreversible, and anything that is built here requires specialized skills the average worker couldn't hope to gain. Not so, says Dan DiMicco, chairman and former CEO of Nucor, America's largest steel company. He not only revived a major US manufacturing firm during a recession, but helped galvanize the flagging domestic steel industry when many of his competitors were in bankruptcy or headed overseas. In American Made, he takes to task the politicians, academics, and political pundits who, he contends, are exacerbating fears and avoiding simple solutions for the sake of nothing more than their own careers, and contrasts them with the postwar leaders who rebuilt Europe and Japan, put a man on the moon, and kept communism at bay. We need leaders of such resolve today, he argues, who can tackle a broken job-creation engine by restoring manufacturing to its central role in the U.S. economy—and cease creating fictitious "service businesses" where jobs evaporate after a year or two, as in a Ponzi scheme. With his trademark bluntness, DiMicco tackles the false promise of green jobs and the hidden costs of outsourcing. Along the way, he shares the lessons he's learned about good leadership, crisis management, and the true meaning of innovation, and maps the road back to robust economic growth, middle-class prosperity, and American competitiveness. 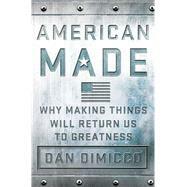 Dan Dimicco is the former CEO and current Chairman Emeritus of Nucor, the largest and most profitable U.S. steel company and the largest recycler in North America. He was appointed to the Department of Commerce US Manufacturing Council in 2008 and served until 2011. In January 2012, the American Institute of Steel Construction awarded Mr. DiMicco the Robert P. Stupp Award for Leadership Excellence for recognition of his leadership in the steel construction industry and for his service as an advocate for domestic manufacturing jobs.